The Shop app is a great way to simplify the life of your regular customers. Using geolocation, customers are shown inventory of local stores and can easily select new items and replenish their supplies. Admin users manage listed items and direct order fulfillment for in-store pickup or delivery. 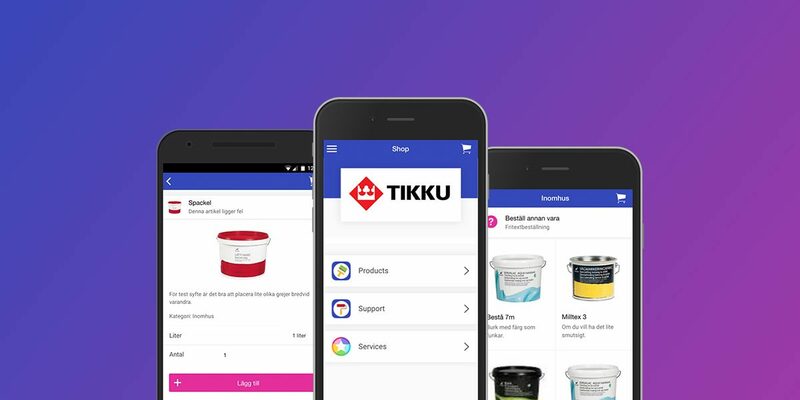 The Shop app was initially requested by a regional paint supplier in Sweden. They needed a current tech-savvy way for their regular customers to request new or additional supplies. With the Shop app, painters can have supplies delivered right to their job site without ever having to set down a paintbrush. This is an excellent service for existing customer who know exactly what they want and may not have time to run to the store. In addition to the great customer experience, the in-store employees are spending less time on simple orders and have more time to spend with customers that need more guidance. End result: Improved customer experience for both new and existing customers. Win, win, win! Initially built for a fantastic client in Sweden, the Shop app is now available internationally.